I’ve closed my mini-greenhouse for the summer. I grabbed the two handles and pulled straight up, moved the green-house aside, and looked at the three lettuce plants that still had been growing inside—two Green Ice and one Red Sails. We’ll have to use those three heads soon because they show signs of getting ready to bolt. Yes, I should have cut them a week ago, but I didn’t. And after growing in the cozy greenhouse for several months, they may react adversely to the colder, windier life outside their plastic box. But lettuce life goes on. 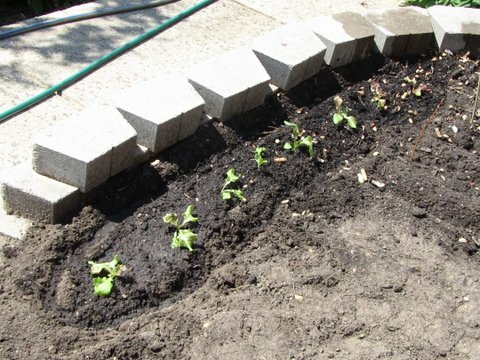 Nearby I transplanted eight lettuce seedlings that I started April 29 in yoghurt cups—two Red Velvet, two Cracoviensis, two Green Ice, and two Red Sails, so we’ll not be dashing off to a supermarket any time soon to buy lettuce. I’ve declared the mini-greenhouse a success. I grew lettuce overwinter and picked heads in January, February, March, April, and May. Of course winter 2011 to 2012 was one of the warmest on record, with temperatures here in central Maryland only reaching lows of 18°F two or three times. What if the temperature had dipped to 15° or 12° or 10°? Would Red Sails and Green Ice have turned into Red and Green Slime? When I hosed off the mini-greenhouse, I noticed several cracks that indicate it won’t last forever. Three of the four upper corners—which were not reinforced when molded as were the bottom corners—had slight cracks. 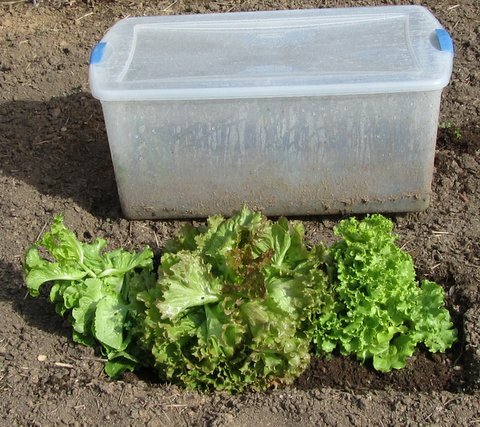 I’ve already duct-taped the cracks in preparation for another winter’s crop of lettuce. 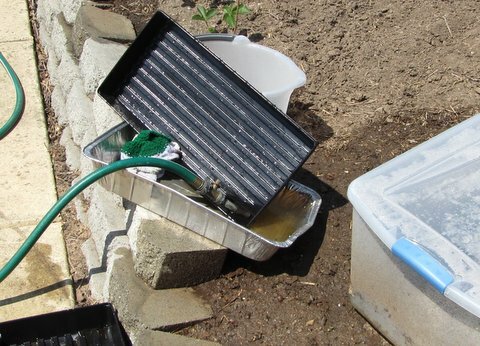 I could have bought a commercial greenhouse—for $150, $1,500, $5,000, or $25,000. But $13.76 seemed like a perfectly reasonable price for a Frugal Gardener. If I get another year of use out of the container—fine. If I get two more years of use—excellent. If I get three years, I’ll be tempted to trade in my bib overalls on a kilt. At the end of the day, I hosed off the mini-greenhouse. It’s ready for growing lettuce again next winter. If you want to see what the mini-greenhouse looked like when I created it, CLICK HERE. ← It’s time to bag apples.